The west coast will be where the kitefishing action happens this weekend. The wind is currently (12 noon Friday ) blowing northeast at 9 knots at the Manukau South Head. The wind strength is predicted to rise to strong to gale northeasterlies by Sunday. The easterly flow should prevail over most of the North Island by late Saturday. In the north the winds will be stronger and arrive earlier. A good fresh wind should allow for easy setting conditions from North Cape to Raglan on Saturday and Sunday should be great. Those further south will possibly have to wait until Sunday for the wind to freshen. For the second week running it seems the fish are still on both coasts in good numbers. No biggies but fish up to 5lb are great fun on a kite rig. Francis Sewak was using his Nighthawk Kite out by the entrance to Houhora harbour and put out two sets of 25 hooks. On the incoming tide, late in the afternoon he managed to catch 16 snapper up to 5lb. This was only the fourth time Francis has used his rig so he is very happy with the results so far. Alan Digby set his kite powered bottom longline rig out from Waipu Cove last Sunday and is very pleased to report his catch of 13 snapper from 2 sets. The flavour of the day was salted bonito bait, which Alan is keen to try again. The fish ranged in size with the biggest weighing in at 5lb. Snapper are in the west coast harbours. Boat fishers are cleaning up on snapper in the Manukau Harbour. This is good news for weekend boaties as the east coast could be a write off with the predicted strong easterlies over the weekend. While the fish are not huge there are a lot of 27 to 35cm fish being caught well up the harbour in sheltered water as shallow as 2 metres. There are quite a few schools of undersized snapper being reported as well, so if you are catching small ones either move to deeper or shallower water to find where the better sized ones are. Using Target Snapper Hooks in these situations will ensure you maximise your chances of catching the bigger snapper. Peter Berry reports the gurnard are in close out on the west coast. Peter was fishing out of Port Waikato over the past week in a boat, not far from the entrance. 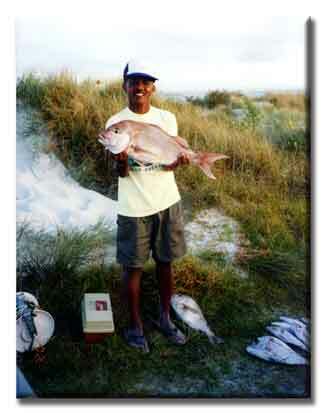 Peter was fishing in 16m of water under the schools of kahawai and landing snapper up to 7lb. Another boat in the same vicinity landed over 40 snapper and were releasing ocean going kahawai all day. The 12-13lb snapper are in 20-30m of water around Port Waikato. Peter seems to think putting a kite out in the same area will result in similar fishing for the beach based angler. With the winds being westerly over last weekend there was virtually no kite fishing to be reported from the west coast. Omaha still seems to be rewarding the keen fishermen with plenty of snapper for their efforts. Reports by club members suggest catches of 10 to 12 snapper per 25 hook set is about the average at the moment. Robbie Cullen has been trying his luck out off Uretiti and has found the best fishing to be a couple of hours before high tide. Once the tide turns the fish are going off the bite. Robbie knows this area well so it is well worth keeping this in mind when planning your next day out on this beach. Kitefishing Club day is on this coming Sunday. Listen to Radio 1ZB for any cancellation or change of venue between 0700-0800 hrs Sunday morning. The public are welcome to attend so get along to one of these days and have some fun while learning some new tricks. The Kitefishing Club invited Bernie Ward along to discuss the proposed Marine Park on the west coast. The park boundaries would be from the northern side of Port Waikato to the Kaipara entrance. This was a riveting subject with a lot of scary implications for kitefishermen, in particular the attempts to ban vehicle access from Port Waikato to the top of Muriwai Beach by some of the plans proponents. The Marine Park has been proposed in response to a Department of Conservation proposal for a Marine Reserve. The Kitefishing Club has an opportunity to submit their thoughts to the committee considering the proposal. The club recognizes the impact the proposed Marine Reserve or Marine Park may have on its members. If you have any ideas on this topic let the club know what they are. Paul Barnes is investigating ways of ensuring the views of west coast beach fishers are considered and their needs allowed for in any proposals. Mfish are mid way through a massive snapper tagging program on the west coast. Over 30,000 fish are to be internally tagged with a special tag that can only be detected and the information read with a special metal detecting wand. The tag is minute and not harmful to the fish or detectable by the fisherman. Injected in behind the head of the fish, the tag remains in position until it enters the processing phase in the commercial fish plants. Information on the fish size, weight and original location where the fish was caught is recorded when the tag is implanted into the fish. These details are compared to the information from the captured fish. The fish pass beneath a special electronic reader in the fish plants which notifies the processors when a tagged fish passes through the system. The tagged fish is then removed for measuring and examination. Details are taken and the location of where the fish was caught is recorded. The objective of the tagging program is to assess the size of the west coast snapper stocks. By all accounts most of the snapper being taken for the project are in very close to the coast so this weekend maybe the time to be putting your kite out west. Trawlers working inside the trawl lines over the coming weeks may be a part of the research project. If you suspect they are not take a photo of the vessel and contact the Ministry of Fisheries. Any requests for information will be responded to in a timely manner with either a note and a suggested link to the site or we will endeavour to find an article from our archive of previous reports. Please include your name, where and when you were fishing, wind conditions, bait, fish weights and what you caught. This helps everyone maximise their fishing time and makes it that much more enjoyable for all of us.